YWCA of Greater Atlanta CEO Sharmen Gowens, right, with Bari Love, led the festive procession at the start of Thursday’s Salute to Women of Achievement event at the downtown Atlanta Marriott Marquis. 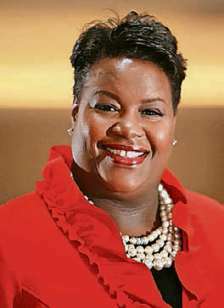 Erica Qualls-Battey, Atlanta area general manager for Marriott International, was honored Thursday at the YWCA of Greater Atlanta’s Salute to Women of Achievement. Those of us who know and love YWCA of Greater Atlanta CEO Sharmen G ow ens (and to know her is to love her) were filled with energy and joy as she led the lively procession at the 2018 Salute to Women of Achievement event, held Thursday at the Atlanta Marriott Marquis downtown. 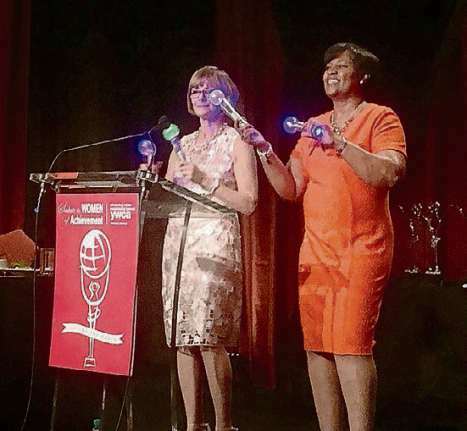 She and YWCA of Greater Atlanta board president Bari Love got the party started in style, strutting into the ballroom with “We Are Family” blasting, festive light-up microphones in hand. By the time the event ended, Gowens had us all in tears. Inducted as members of the 2018 Academy of Women Achievers were Dr. Debra Carlton, associate medical director for patient care experience for the Kaiser Permanente Medical Group; Accolades President Daryll Griffin; Agnes Scott College Board of Trustees Chair B eth Holder; Erika James, dean of the Goizueta Business School at Emory University; Anne Kai ser, vice president for community and economic development at Georgia Power; Veritiv Corp. Chairman and CEO Mary Laschinger; Public Broadcasting Atlanta President and CEO Wonya Lucas; Atlanta Botanical Garden CEO Mary Pat Matheson; Beatriz Perez, senior vice president and chief public affairs, communications and sustainability officer for The Coca Cola Company; and Wendy Stewar t, Atlanta market president for Bank of Americ a.
Erica Qualls-Battey, area general manager for Marriott International overseeing the Atlanta Marriott Marquis, Atlanta Airport Marriott, Renaissance Atlanta Airport Gateway, Atlanta Airport Marriott Gateway and Atlanta Marriott Suites Midtown, was honored as the 2018 Woman of Achievement. The capacity crowd also heard inspiring remarks from a domestic violence survivor who underscored the organization’s important mission. Toward the end, Gowens approached the microphone and stunned the crowd into silence. As a result of all the juggling, she missed her 2017 mammogram. A makeup appointment in January was followed by a biopsy in February and surgery in March. Chemotherapy and radiation come next. “Everything was moving fast, and then my world stopped,” Gowens said. She is confident of a positive path forward. “I reached out to my sisterhood, and I found support. I found strength in my faith,” she said. 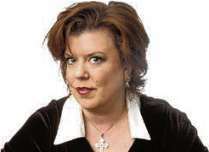 Sharing her story underscored the importance of giving back. She said she is grateful to have the means to combat illness but is mindful of those who don’t. Through its ENCOREplus program, the YWCA educates medically under served women about breast and cervical cancer awareness and helps provide free clinical breast exams, mammograms and Pap tests. More than 1,000 uninsured women in greater Atlanta are served annually. For information or to donate to this or other YWCA programs, see ywcaatlanta.org.